No one really cross shops a Ford Fusion and a BMW 3 Series. But now that we know it has a tire stomping 380 lb-ft of torque and costs under $34,000, could this new Ford Fusion Sport be the affordable, German-slaying American sedan we’ve been waiting for? On the surface, the 2017 Fusion Sport doesn’t look much different than the regular Fusion that you can pick up for a tick over $22,000. The Sport has a blacked out grille and some mean looking 19-inch “Tarnished Dark” rims, but it will take a keen eye for someone to know that the Sport is something special. The Fusion Sport starts at $33,850 including destination. Check off every option box and the price climbs to about $42,000. That sounds like a lot of money to spend on a Ford sedan that looks like a car you could pick up at the rental counter, but the value proposition changes because of the stuff you can’t see. Under the hood is a 2.7-liter V6 twin-turbo Ecoboost motor pumping out 327 horsepower and a massive 380 lb-ft of torque. That’s quite a bit more torque than we thought; Ford initially quoted a target torque figure of 350 lb-ft. All that juice should have no problem getting to the pavement with the Sport’s standard all-wheel-drive. Ford is estimating a 0-60 time in the low five-second range. I’ll wager the real word tests do a bit better than that. Since the Taurus SHO turned out to be kind of a non-starter, this could be just what the doctor ordered. If you want similar power levels from Europe, you are going to have to spend a lot more money. Audi’s all new S4 brings 354 HP and 368.8 lb-ft to the fight with a starting price of around $50,000. The BMW 34oi xDrive has 320 HP and 330 lb-ft of torque and starts at $48,795. Does The Audi S4 Still Matter? The only German that will get you more twist within a somewhat reasonable price range is the Mercedes C43 AMG. That car has 362 HP and 384 lb-ft for an MSRP of $51,725. Keep in mind all these prices for the German cars are before you start adding on the numerous and expensive option packages. 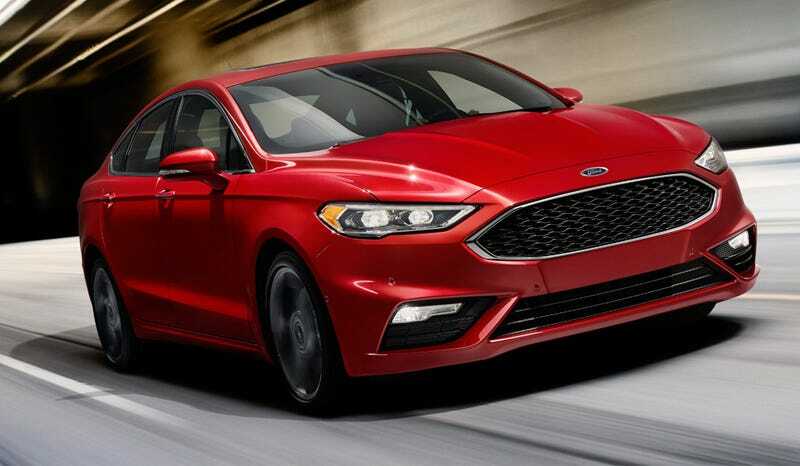 Even without additional options the Fusion Sport comes standard with things like leather seats with suede inserts, and high-tech self-adjusting dampers that can “hover” over potholes. The Fusion Sport is not going to drive like a $50,000 European luxury car, but that’s OK. Some people don’t need all that coddling nor do they care to brag about the badge on the hood. They just want a lot of speed and the ability to seat four adults without spending a small fortune.